This poster illustrates the Male Body with the Governor Channel (Yang) with the detail explanation surrounding figure by each individual point of Microcosmic Orbit, beautifully illustrated by Universal Healing Tao Senior Instructor Juan Li's original meditative art drawings. We can become conscious of this movement by tracing it mentally with our mind's eye from each of the fourteen points of the orbit by the use small sips of air helping our mind to focus on the energy movement up the spine and down the front of the body. 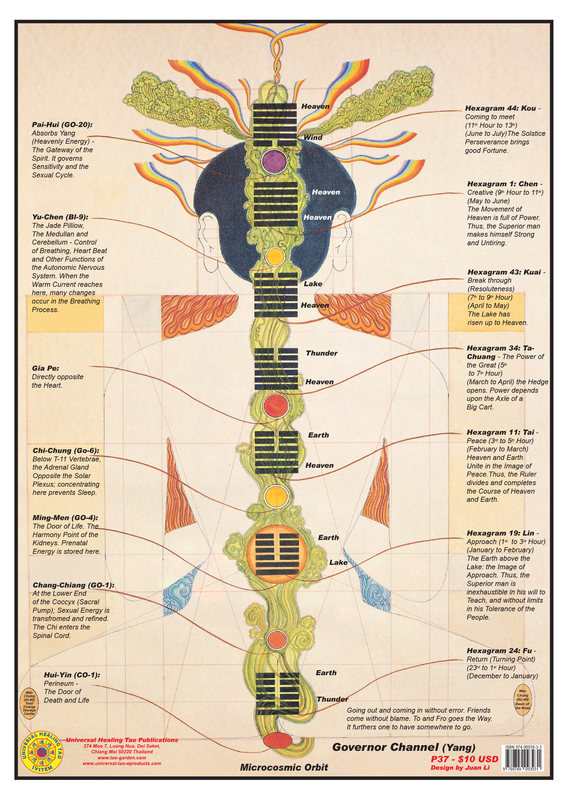 Then by using each point up the spine and its counter point (Navel to Men Ming, Sexual Palace to Sacrum, Perineum to Crown Point, T-11 to Sternum, Wing Point to Heart Center, C-7 to Throat Center and Jade Pillow to Mid-Eye) we can spread the energy across and heal each section of the body with the healing energy (light).